This shower gel and foam bath blends the antioxidant qualities of wild seaweed with lemon aromas. A perfect balance between the green and the blue halves of our planet. 100% natural fragrance, with essential oils. Free from parabens and SLS. 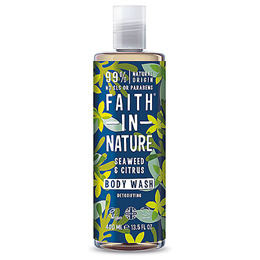 Below are reviews of Faith in Nature Seaweed & Citrus Shower Gel & Foam Bath by bodykind customers. If you have tried this product we'd love to hear what you think so please leave a review. Nice fresh scent, but not my favorite. Great that there's no SLS.